With the MLS regular season coming to a rapid close, Seattle’s heroes in the Rave Green will visit Houston Dynamo after a much-needed two layoff. After suffering through an injury plagued season, Seattle is finally healthy, with only injured center back Roman Torres unavailable for the last two games and the MLS Playoffs. Seattle’s chance to clinch a playoff berth is also on the line this week against Houston, who has struggled all season to find their identity. Our coverage starts here. Make sure to follow us on social media during the match, and check out the soccer related links at the bottom of this article. Eddie Robinson, who works for the Houston Academy and as a color analyst for the Dynamo broadcast team, sees an issue with makeup of the Dynamo. This Dynamo team really is the first one that I remember that has struggled to find its identity. It has not been easy to determine what are their strengths and weaknesses are and figure out their style of play. A few weeks ago, Houston beat Kansas City 1-0 at home with no problem. The team looked good and they were really in contention for a playoff spot. The thorn in this team’s side, though, has been FC Dallas. They came in and the Dynamo didn’t have an answer for the speed they presented in that match. While the Sounders are mostly healthy, don’t expect a “best XI” lineup from the Sounders. Captain “Super Brad” Evans and Clint Dempsey are just returning from a depressing stint on US Men’s National Team duty. Forward Nelson Valdez is nursing a leg injury from the pounding MLS teams have given him, and from being repeatedly kicked in the legs. Guatamalan National Teamer, midfielder Marco Papa, scored in a match on Tuesday vs. Honduras in World Cup qualifying play to give Guatamala the early lead. However in distressing news, Papa was removed in the 36th minute with an undisclosed injury (hamstring probably given how this season has gone). The Sounders do have a deep team to rely on and while Papa is an offensive force to be reckoned with when he is on form and healthy, he is not as critical as he was at the start of this season. 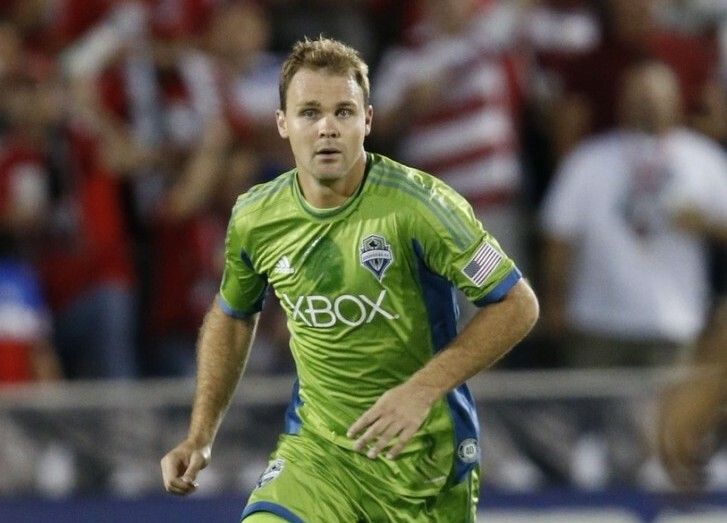 Expect winger Andreas Ivanschitz and Lamar Neagle to fill in for Papa if he is not able to go. The Dynamo are a mediocre team on offense. See the chart below. As you can see, Houston has scored a similar number of goals as the Sounders. They are led by forward Will Bruin with 11 goals, Giles Barnes with 7, and Ricardo Clark with 7 more. Normally deployed in a version of the 4-4-2 (stacked). This formation deploys 4 defenders, 4 midfielders, in two flat banks. The forwards are normally stacked one directly in front of the other. Giles Barnes usually plays the “10” under Will Bruin deploying as a classic “9” target forward. However, this team has been up and down all season. They have had no flow, chemistry, or consistency in the attack. They shoot more, and miss more than Seattle. They also don’t seem to be able to play any sort of possession game. They will try to pass up the wings, and over the top. Expect the Sounders fullbacks (outside backs) to play it safe and not make many overlapping runs in an effort to prevent the Dynamo wingers from getting behind the Sounders defense. While Houston can attack from many fronts, this group should be no real challenge for the Sounder back line as long as 2 out of 3 center backs are fit (Brad Evans, Chad Marshall, Zach Scott). If Seattle has to rely on a youngster, then the back four could be in trouble. With Oniel Fisher possibly out with a hamstring (another one?!?!?!?!?!?!?!) for this week, the Sounders had better be thankful that Brad Evans feels fit after playing 90 minutes for the US on Tuesday, and a miraculously healed Marshall feels fit enough to go Sunday as well. The Houston defense has been leaky to say the least. They have really struggled this season allowing 45 goals, 11 more than Seattle. This team has struggled like most teams in MLS with a shaky center of the back line. Unlike the Sounders, the Dynamo do not have a brilliant defensive midfielder, al la Osvaldo Alonso, nor a good duo of center midfielders who can go box-to-box, and protect the defenders, and lead the attack. Luis Garido plays in the center of the pitch and is more defensively focused. Also Rasheed Olabiyi also has been playing next to Ricardo Clark in the center midfielder spot. When evaluating this game on the basis of pure talent, the Sounders should pound this Dynamo team. The Dynamo have been very hard to beat at home. They boast a very good 9-4-3 record at BBVA Compass Stadium. Seattle has an inverted record of 4-9-3 on the road this season. Seattle has had a long streak of bad luck with injuries this season as the curse of the lame hamstrings has struck Seattle this season. Currently left back Oniel Fisher, and Marco Papa are currently afflicted. This is unfortunate as Papa has brought creativity and flair to Seattle since his return from DUI and international duty. Last Tuesday he scored a great goal for Guatamala in a friendly vs. El Salvador. The most important intangible is how will the Seattle passing attack look after two weeks off, national team call ups, and with lingering injuries. Have the Sounders figured out their chemistry issues? Can Alonso, and Gonzalo Pineda/Erik Friberg figure out their chemistry and defensive issues? Can Ivanschitz put together a good 90 minute shift? Will the dual strike team of Oba-Deuce find their early season mojo? Are the center backs going to be healthy enough to overcome “Kamp Klinsmann” (Evans), a broken foot (Zach Scott), and a sore sprained neck (Chad Marshall)? The other item is that Seattle has much more to play for this week than Houston does. With the Dynamo all but mathematically eliminated from the MLS Playoffs, Seattle has much more on the line than the men in orange. If Sounders win, they are in. Very simple. This game is a character check. The Sounders should have superior motivation. Controlling the ball and possession throughout the contest will be critical for Seattle. With Dempsey, Martins, Evans, Alonso, Pineda, Friberg, Papa, Andreas Ivanschitz, Nelson Valdez, Lamar Neagle, Marshall, Tyrone Mears, and Stefan Frei, Seattle has the tools in place to dominate possession. So far this season, the Sounders surprisingly lead MLS in fewest goals allowed. They have the best defense in the league. If defense wins championships, Sounders defenders must keep this proud trend going. They have been very good against their opponents during the run of play. The weakness has been off of set pieces. If Lamar Neagle, Oniel Fisher, and Brad Evans can improve their man-marking, we shouldn’t give up any more set piece goals. With 12 goals allowed from corners (4), free kicks (6), and penalties (2), the Sounders need to do a better job of not allowing these situations do develop. When they do happen, Seattle must have a clear understanding of whether they are playing man to man, or zone marking on the set piece. This should be a romp: Houston 0, Seattle 3. Seattle’s offense finally clicks and hits all cylinders; Dempsey, Vadez, and Ivanschitz all score. Seattle’s defense will once again be lead by Brad Evans and Stefan Frei. Have your own prediction or comment on the game? Join the SSU community, leave a comment below and “like” us on Facebook. Sunday, October 18th in Houston at BBVA Compass Stadium. ESPN 2, 2PM kickoff, WatchESPN app. Follow us during the game @SeattleSideUp on Twitter and watch us this Sunday at 8pm (pst) on YouTube as we discuss the games played this week. Has Dempsey been worth the investment? Does MLS have a time bomb with their sponsorship plan? USA lost tactical battle, with this loss should we cut our losses and try to avoid the sunk cost fallacy? The USA v. Mexico match showed the lack of skill and cohesion doomed the US. Despite Klinsmann’s claim it seems that Fab Jo is injured. What is the overall direction of USMNT? A brief history of US at the 2002 World Cup. Jurgen not a quitter. Right not not a winner either. No offensive identity for USMNT!!!!!!!!!!!! Because of this its time to go back to basics for the USMNT. ESPNFC gave their thoughts on the USMNT during a roundtable discussion. Who’s next man up as USMNT boss if Klinsmann is fired? Klinsmann wants players to show character, class, maybe he should too? How did the US lose to Costa Rica? Don’t count on the young guns to save USA, the cupboard is bare. Playing the Costa Rica friendly was dumb. Abe’s “boy” DeAndre Yedlin says ‘Natties” are not playing as a “team” Why wold this be an issue? Can’t pick a keeper? Let’s use 2! Problem, Guzan is inferior to Howard. What exactly is inside Jurgen’s mind? Is it like “Inside Out” from this summer? This is a period of dire straights for US Soccer, says Matt Doyle. This was just more of same for us after loss to CR.